The fate of soda is in the hands of Berkeley voters. As November approaches at breakneck speed, so does election season. This year, Berkeley residents will be able to choose the fate of the price of sugary beverages, soda in particular. Measure D, also known as the Berkeley Soda Tax, proposes a one-cent-per-ounce tax on “sugar-sweetened beverages” and sweeteners, such as sugar, honey and syrups. Drinks that are exempt from the bill include dairy products, diet drinks, 100% juice and alcohol, to name a few. The bill, however, is not as simple as you may think: while most sugary drinks, including soda, will be affected by the tax, a small handful of drinks will not be. For example, dairy products won’t be affected, leading some skeptics to wonder why sugary chocolate milk will be exempt, while low-calorie coconut water won’t be. Opponents of the bill often cite the measure’s purportedly confusing wording as one of its downfalls. In September, the bill underwent wording changes after some claimed that the wording was too ambiguous. 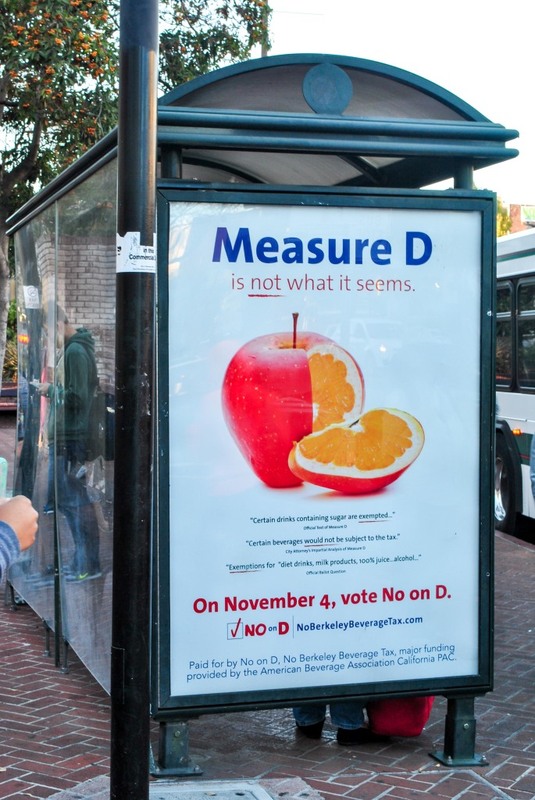 As of right now, the American Beverage Association has donated approximately $1.4 million dollars to fund the “No on Measure D” campaign—the most any private organization has contributed to a campaign in Berkeley city history. The widespread effect of this funding can be seen around the city with everything from posters at bus stops to signs plastered on BART station walls. Advocates for the bill claim that it will be an instrumental step in combating childhood obesity. According to the “Yes on Measure D” campaign site , known as Berkeley vs. Big Soda, 40% of children are in danger of developing childhood obesity. Additionally, one out of three children born in 2000 will develop type 2 diabetes, according to the site. Support for the measure has been divided—many say that having the tax will educate the public and children, in particular, on the alleged “dangers” of sugary beverages. Those who are against the bill, however, state that leaving some beverages exempt from the tax makes the measure unreliable. Whatever the outcome, public debate regarding the tax has generated unprecedented awareness regarding sugar-sweetened beverages and their impact on health. Disclaimer: Any slant or perceived slant in this article does not reflect the opinions of Spoon University or its members. Are you in support of or opposed to the proposed soda tax?